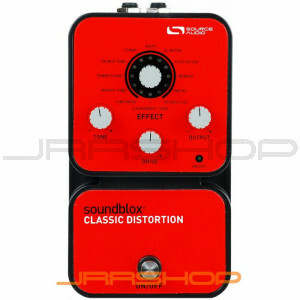 The Soundblox Classic Distortion packs 4 tube amp and 8 fuzz box overdrive tones plus a Clean Boost/Tone mode into one compact and easy to use pedal. Unlike other products, which attempt to digitally clone, model or emulate vintage gear, the organic tones of the Soundblox Pro Classic Distortion are the result of a five-year listening study and iterative algorithm design process involving over 40 classic pedals and extensive artist evaluation. Diverse sound palette — Featuring 11 varieties of classic distortion sounds with an added CLEAN BOOST / TONE mode. Modern design — A thoughtfully designed box which features rugged construction and sleek looks. Motion Control — all Soundblox pedals are ‘Hot Hand Ready’ and can be used with any Hot Hand motion sensor to extend the capabilities of the unit.